A young Dorothy Maynor first sang publicly in the choir of Norfolk’s St. John AME Church, where her father was pastor. As a student in a college preparatory program at Hampton Institute (now Hampton University), she performed at Carnegie Hall and toured Europe with the Hampton Choir. 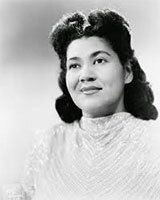 After graduating from college, Maynor studied music in New York, where she first sang at a picnic for members of the Boston Symphony Orchestra at the 1939 Berkshire Music Festival at Tanglewood, Massachusetts. Her formal debut at New York’s Town Hall later that year was followed by performances with the Boston Symphony at Carnegie Hall, and the New York Philharmonic Symphony Orchestra. Each time, she drew rave reviews. Maynor remained a concert soloist throughout her career, but featured dozens of operatic arias in her programs, including her signature piece, “Depuis le jour,” from Charpentier’s Louise. Maynor was the first black artist to perform in Washington’s Constitution Hall, and sang at the presidential inaugurations of Harry S Truman and Dwight D. Eisenhower. She was among the most highly-paid singers in the concert world and her recordings were consistent best sellers. Although she never performed with the Metropolitan Opera, Maynor joined the company’s board of directors in 1975, the board’s first African American member. Maynor retired from performing when her husband became ill in 1964. At her husband’s urging, she began an arts program in the church’s basement, starting with 12 piano students and adding other disciplines and instructors as more pupils enrolled. This was the beginning of the Harlem Arts School. Today, the school occupies a $2 million, 37,000 square-foot facility, with programs serving more than 3,000 young people and adults annually. One of the school’s first ballet teachers, Arthur Mitchell, founded the Dance Theater of Harlem in 1969.